This year’s Mental Health Awareness Week in the Junior School had plenty of workshops, activities, learning opportunities, relaxation and guest speakers. Social worker Danielle Rovinski, along with Dean of Middle School Activities Jennifer Bonetta, organized an amazing week for the boys that allowed them the opportunity to both learn and reflect. Ms. Rovinski’s hope for the week was to destigmatize mental illness and to normalize mental health. Every day began with a seven-minute meditation in the classrooms and on Wednesday, there was a “Breakfast and Chill Morning” that included oatmeal chocolate chip cookies, yogurt and fruit. The boys participated in animal therapy, has the option to attend a lunchtime chat on anxiety management and the Grade 6 class took part in an expressive arts therapy workshop. 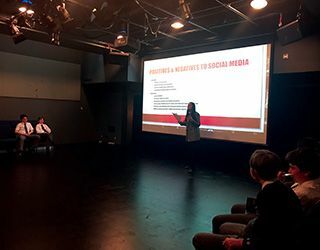 The Grade 7 and 8 boys listened to an important talk by Social Worker Kate Best about substance abuse, and both grades sat in on a workshop about the Effects of Social Media on Mental Health. Aidan Arabzadeh, Grade 6: It’s important to have Mental Health Week because if someone has a mental illness, you can be aware and you can help them. It also teaches us to take care of ourselves. Isaac Feiner, Grade 7: It’s important because we need to raise awareness for people who have mental health problems. Adam New, Grade 8: You can talk about the things that trouble you in a safe environment. I thought it was a great week. Duncan Landry, Grade 8: Everyone should have a chance to learn about what mental health is and get a greater understanding of mental health. I enjoyed the week.